Sometimes (especially in a churchy/children's worky context) I make things which aren't really writing, even if they involve some writing. Anyway, that's what's on this page. This is a Palm Sunday service I was supposed to do with someone else, but they were ill so I ended up planning and leading the whole thing myself! It uses quite an Anglican model but could be adapted for many styles of worship. I also turned the same planning into a sermon for our more traditional 9:30 service which can be found on my 'sermons' page. Songs are suggested which fit the theme of each 'movement' of the service, but these could be swapped out for things you're more familiar with. At our church's after-school club we needed a way of quickly communicating stories so that other activities could be based upon them. I hit upon the use of '5 Sentences' - a beginning, an end and three points to join them up. These proved highly effective. If you want to create your own, they take a bit of practice but can be very useful when you don't want to spend too long on storytelling and get on to other things. Here are some examples of 5 Sentences which I wrote for a series on 'mountain top experiences'. 1. God wanted to test Abraham so told him to kill his only son Isaac to prove how much he loved him. 2. Abraham took his son Isaac and climbed up a mountain with everything they needed for the gift. 3. Isaac saw they had nothing to give to God but Abraham said God would provide something. 4. When they got to the top of the mountain, Abraham got ready to kill Isaac. 5. At the last second, God told Abraham to stop – he had already seen how much Abraham loved him. 1. Moses climbed Mount Sinai to meet with God. 2. God and Moses talked for a long time about how God wanted people to live. 3. God said that people should love Him more than anything, and also love and be kind to one another. 4. Moses wrote down everything that God had told him. 5. The most famous instructions God gave Moses are called ‘The Ten Commandments’. 1. Elijah was a prophet who loved God, but there were many people who loved a different god called Baal. 2. Elijah challenged the prophets of Baal to a contest – which God would give them fire from heaven? 3. No matter what the prophets of Baal did there was no fire from heaven. 4. Elijah made fun of the prophets of Baal – he even thought their god might be on the toilet! 5. When it was Elijah’s turn he poured water on the fireplace and then, after just one short prayer, fire came down. 1. Abraham went up a mountain to show God's love, Moses to show how to live, and Elijah to show His power. 2. Jesus went up a mountain to show His love, to show how to live and to show God’s power all at once. 3. Jesus was made to go up a mountain where he was nailed to a cross and died. 4. He did this because he loved everyone, and to help people to live good lives. 5. Three days later, God showed his amazing power when Jesus came back from the dead. I love a quiz and over the course of almost a decade of Church children's work I've developed around half a dozen quiz formats, a few of which are outlined below. Some of these involve running around, some are for teams or individuals. If you wish to use any of these, feel free but please do drop me an email to let me know how you got on (or to ask for any clarifications). This is a simple true/false quiz which is good for running around. Questions are read out (or, ideally, projected - I tend to make interactive PowerPoint versions of the quiz with animations for each of the answers) in the form 'The first words in the Bible are...'. Two ends of the sentence are given, i.e. 'In the beginning' or 'Once upon a time', and these are each assigned to one end of the room. The children must run to the end of the room assigned to the answer they believe is 'Bible' and avoid the end of the room assigned to the answer they believe is 'Bogus'. This is a good way for kids to recap key story points at the same time as letting them burn off some energy. This is a great way of humiliating a vicar which, I dunno, might be a priority for you? b) slightly advantages the children. You'll need a bunch of trivia questions and some dry-erase boards with markers. An adult is selected to be 'The King' i.e. the expert on all things - give them a crown to wear to really rub it in. For each question, both 'The King' and the children (who are working as a team and can confer) write down the answer on their boards. The answers are then revealed and points assigned. The first to five points wins (this usually gives about a ten minute game). The game is surprisingly balanced as the adult is working by themselves whereas the kids are pooling their knowledge and one of them will usually pull the answer from somewhere. If needs be you can always throw in a recent pop-culture question to give them a boost! NB: To humiliate your vicar, make them the king, give them a really Bible literate Sunday school group to take on, and watch as all those weird Bible facts abandon them in their hour of need! This is a game for individuals or small groups where you use trivia questions to solve a simple substitution code. You will need 12 multiple choice questions written on bits of paper stuck around the room. Each correct answer tells you that a letter must be substituted for another, i.e. in the code an 'i' stands for 'u' and vice-versa. You will need 12 questions as each substitution goes both ways, and i and u are given to you at the beginning. Make sure that if they put the wrong answers in this will conflict with something later, i.e. if they get question 1 right, but question 2 wrong, they will find that they have two substitutions for the letter 'a'. This tips them off that they've done something wrong! The children work their way around the questions and fill out a letter grid. When they have a complete alphabet they can then solve a code where a key word or phrase - usually your 'take home message' for the session - is revealed. So long as they get the correct answer to the code, you can assume they got all (or most) of the questions right. Every year since 2014, our church does a holiday club which caters to around 60 children during the first week of the summer holiday. I have been involved in planning, up-the-front presenting and leading small groups every year except for 2016 (which took place two months after the birth of our first child) and since 2015 have been writing material for it. 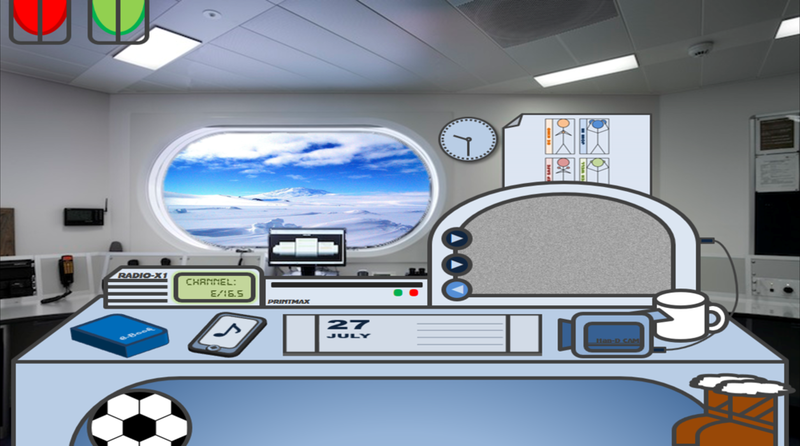 In 2015, we were using a Scripture Union outline called Arctic Explorers, but felt that another character was needed to do a quiz and consolidate some of the learning, so I created 'Sir Edmond Hilarity' for this purpose. In 2017, we used a Scripture Union outline called Landlubbers as a springboard but wanted to use different verses which meant that much of the content had to be rewritten completely. One of the new sketches I wrote for that year can be found here. When all was said and done, it was more or less only the character names and a few of the segment titles that remained. As a result, for 2018 I decided to do the whole thing from scratch. Safari Sparks was our first in-house generated holiday club. We had surveyed the children to decide what theme they would like and animals was a popular choice and we decided that we wanted to explore stories from the book of Daniel. With that as my brief I set about coming up with an overview timetable, characters, sketches, songs - everything we'd normally get out of a Scripture Union book. Some of the material I produced can be found below. If you would like to use the Safari Sparks material or - even better - if you would like me to work with you to create holiday club material especially for your church, please get in touch to discuss what I could do for you and get a quote. I also found Daniel 2:20 - Praise the Lord forever and ever. Power and wisdom belong to him - to be our memory verse. We also wanted to have some New Testament content. Initially this was going to match with Jesus teaching, miracles and the idea of the kingdom of God, but later in the development this was simplified to be the Lord's Prayer which we matched with the daily themes. We did, however, also use clips from The Miracle Maker to complement this. Sue is the main leader who runs the club and the Safari Park. She is doing research to get her PhD from the Open Zooniversity and the main teaching point each day contributes to this. By the end of the last day, her research is complete and she is awarded with her qualification. Helenephant the Elephant and Heidina the Hyena are the odd-job animals around the Safari Park. They tell the stories about Daniel, but are always at a loss to say what they mean. Sue Vannah helps them to see the main teaching point in each story they tell. William Snakespeare consolidates the story with a quiz (see below) and a deeper exploration of the theme. His two catchphrases (POETRY!!! and THAT'S THE TEXT; WHAT'S THE SUB-TEXT!?) became highlights of the club. You can hear a clip of William Snakespeare from our end-of-club Sunday Service here. A film critic who introduces the clip from The Mircale Maker and links the main teaching point for the day with the Lord's Prayer. Our daily sketch segment was called Lore Of The Jungle. These took the form of 'Just-So Stories' narrated by a Lion and were performed by our youth team. For more information and to read one of the scripts, click here. For every story, William Snakespeare presented a 'work in progress' poem which he asked the kids to help him complete. The poem was a retelling in five couplets of whatever the story was that day. The second line in each couplet was given in two variant forms - the real one and a silly alternative - and the children would 'vote' on what the next line should be. On the last day, I did let them vote through one of the silly ones, although we did agree to swap it for the proper one later! This is the quiz from the celebration service, which actually had six couplets to fit in the whole Lord's prayer. You can listen to the audio of the service here if you want to see how it played out in practice. Your holy name we set apart to love; / I pray you'll help me find my misplaced glove. And see your will be done on Earth below; / It's somewhere in the Gulf of Mexico. From holy word to bread on which we feed; / Like, I could use a jacket made of tweed. As we forgive all others, as you taught; / Especially all the times when we got caught. But keep us safe from evil all our days; / And make the sun shine on our holidays. Your power and glory last forevermore. / And during sermons, help us not to snore. Whenever we get a holiday club from Scripture Union, it comes with a theme song for the club and a song to help remember the memory verse. Not to be outdone, I bashed out these on the ukulele and then handed them over to our extremely talented Youth Minister who knocked them into shape and recorded them properly, with the Youth team providing vocals, cheering and animal SFX. There's a lion - RUN AWAY! So hear us shout WAHAY! Now cheer and off we go! And always do what's right. Verse twenty says it's true. For each club I make a 'hub' which pulls together images and audio for every section of the club. The images below show the main screen, which is projected above the stage, and almost every object on the screen is a clickable element which plays a jingle and shows a logo for a different part of the programme. Game timers, attention-getting klaxons, song music and lyrics, etc. are all accessible from within this same file which streamlines the technical side of running the club and creates a fun audio/visual language which can help children understand whereabouts in the session we are - usually by the second or third day they're dancing along to all the music! The hubs are created in PowerPoint and really stretches that application's abilities - there are other programs which would be easier and better to use but I don't know how to use them. I have also created similar, but much more stripped down, hubs for after school clubs and Sunday schools. Click on the Mega Makers thumbnail for a video with more information. The theme of this year's club was about making machines so I based the hub on a machine with menu items for each activity. The machine could even rotate to 'project' songs in one orientation, or run a quiz in another. This year I relied less on a menu and more on each object in the Arctic base (Arctic Explorers was the theme of the club) linking to a specific part of the programme. This holiday club had a pirate theme so the hub became the deck of a ship. 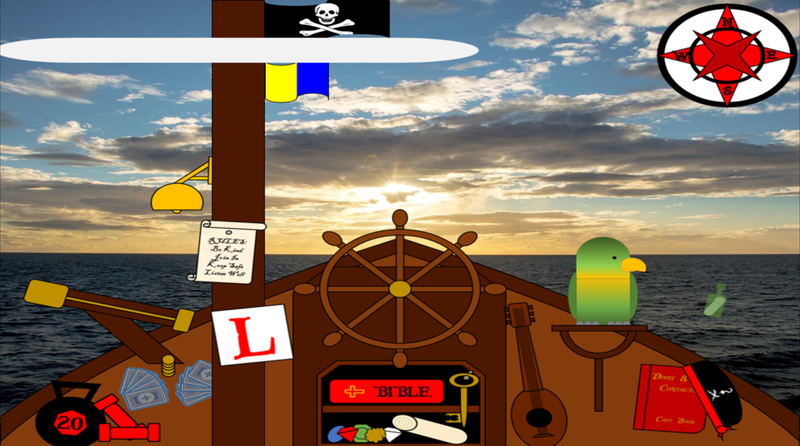 Again, each of the things on board linked to an activity or drama with a theme song, but this year I also had fun with the parrot who I animated to dance and sing along! This year, in an attempt to make things quicker and easier for myself I leaned heavily on PowerPoint's zoom transition which allows you to add an image of a slide as a hyperlink and zoom in and out of it. In reality, all this did was free up time to play with other things and it ended up being probably the most complicated one yet. To give just one example, the rotary telephone (which is used to launch prayer based activities) dials different numbers depending on which segment we're actually going to - 777 for regular prayers, 6913 for the Lord's Prayer!